Nokia has launched the beta version of its developer recognition program, Qt Ambassador, exclusively on QtCentre.org. The Qt Ambassador Program is membership-only program that honors Qt developers and their projects. All developers around the world who create products and projects with Qt are eligible to apply. 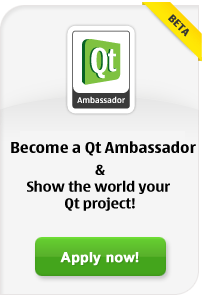 Membership to the Qt Ambassador Program is free and based on your outstanding and innovative Qt projects. Two years ago the QtCentre site was launched. The goal was to provide the leading forum on the internet, encouraging the exchange of experience and to provide a meeting point to the Qt community. The response to this has been beyond our wildest expectations - all thanks to all our visitors and contributors. We are happy to announce that J-P Nurmi (jpn) and Marcel Nita (marcel) were promoted to Super Moderators at Qt Centre forum. Also upon request from Uwe Rathmann (Uwe) a new section devoted to Qwt was created and Uwe became its moderator. Exactly one year ago â€“ on Jan 5, 2006 â€“ QtCentre.org was announced to public. Throughout this year we've been doing our best to provide you with the best possible place to share your knowledge related to Qt through the forum and wiki and we intend to continue doing that. Happy birthday QtCentre! For some reason our server thinks that today is 16th October 2005, so we are experiencing problems with Joomla and vBulletin. Hopefully the correct time will be restored soon and everything will go back to normal. Update: It seems that everything is OK now, but few threads got scrambled. Half a year ago a new Qt oriented website was born â€” QtCentre, the Ultimate Qt Community site. The reason for establishing QtCentre was to give the Qt community a new top notch, working and helpful place to share and seek knowledge and experience related to Qt. We have prepared few banners that you can place on your own websites to promote Qt Centre. Also we will be very happy if you send us your own designs. We will choose the best ones and place them here too. Starting from yesterday afternoon we were experiencing database problems caused by stale database connections which resulted in Denial of Service. The site was unresponsive for few hours around midnight until, after heavy brainstorming from your favourite admins and heroic rescue (or rather assault) mission, the order has been restored and the Light Side of the Force has once again triumphed. From now on until the World ends minstrels will sing songs about your favourite admins who saved the day (again). Today QtCentre user database was prunned which resulted in removing several accounts which were not confirmed by using a link from an activation email and have not been active since January.